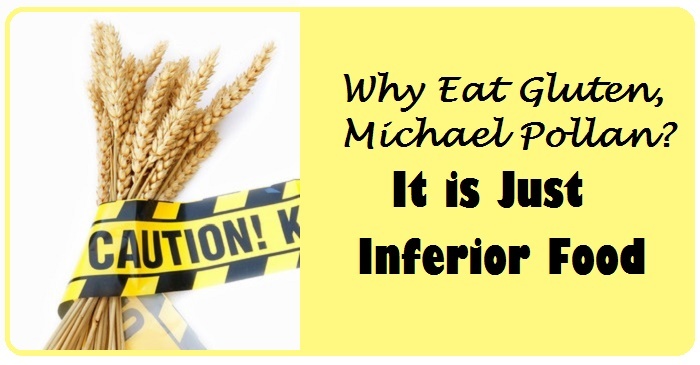 We have given you many reasons why adopting a gluten-free and grain-free diet can help your health tremendously, but celebrity author Michael Pollan says eat it anyway. But our argument is what it has always been…is eating grains as the primary source of calories in your diet GOOD for you? Has the suggestion of the food pyramid based on grains helped us become healthier as a society? There is absolutely no statistical information that supports that at all. In fact, this is the first time in history that a baby born today life expectancy less than that of his or her parents. Grains are fine if in the case of famine. It will sustain you so you don’t die. But most of us are not in a short-term survival situation and should be eating for long-term health and not short-term survival. So…even if grains did not cause all the problems that many of us see and experience when we eat them, it is like putting water in your gas tank; It may still run for a while, but it is NOT a good choice and you will have to fix the issues that you caused eventually. Wouldn’t it be better to fill up and fuel your body with healthy things that are MEANT to nourish us, heal us and make our whole systems run better? We think so too. What is Wrong with Legumes on a Whole30 or Paleo Diet? What is Wrong with Soy?